GoPro Hero3 , 4K is here in Baby Steps for $399.99! 4K HD at 15fps and 2.7K at 30fps is AWESOME for $399.99, and actually outdoes the BMCC resolution in a matchbox. Looks like we are in for some awesome footage coming soon! GoPro Cinema 4K is coming pretty fast, just need a few more frames and a little more time! Don't see anything extra fancy. Newer sensors allow much higher frame rates. Check posts abotu Sony and Aptina ones. RIght now limit lies in LSI, RAM and memory cards, not sensors. Here I mean small sensors. 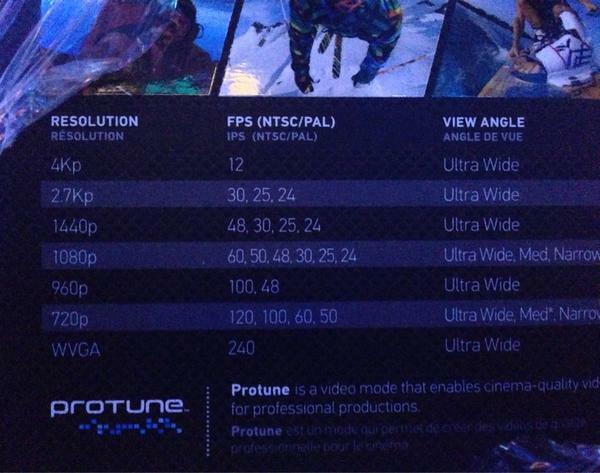 Damn... look at the other frame-rates. 1080p 60fps and 720p 120fps!!! A man basically jumps out from Outer Space to Earth with a GoPro and Parachute, and yet we still complain? For only $399.99, I think it's an awesome deal in 2012, and says to everyone else- 1080p is so 2011... try harder! PS. GoPro: For the stunt, Baumgartner was fastened with high-definition video cameras. Wearable camera provider GoPro, an Inc. 5000 company that raked in $250 million in revenue last year, tweeted on Monday: "Red Bull reports all 5 GoPro cameras mounted in Felix's suit worked perfectly & the footage will be released shortly." That's pretty fancy though VK, some nice choices there. Micro SD card is a bummer, i'm always losing them, but had to be to reduce the physical size 30% according to the Announcement on stage at the Event. An interesting choice for MicroSD, it still would've been a small camera if they kept the same form factor and allowed for SD. But the MicroSD market will catch up and offer nice options in the future. There are already 30mbs options for Micro, so that's good. I think people will add weight for those mini-stabalizers anyway, but having a smaller form factor and still having these great res/fps options is amazing. Again, great forward thinking by GoPro. 4K @ 12fps isn't really useful, but a win for marketing. "GoPro has 4K" - I've seen this a lot tonight. Smart move overall. 120 fps at 720p is pretty cool. 4k at 12 fps is like a Ferrari that has a max speed of 20 mph. The 1080p youtube version looks fantastic, so does the 720p. not available before beginning of january in France... Any chance to preorder from US ? 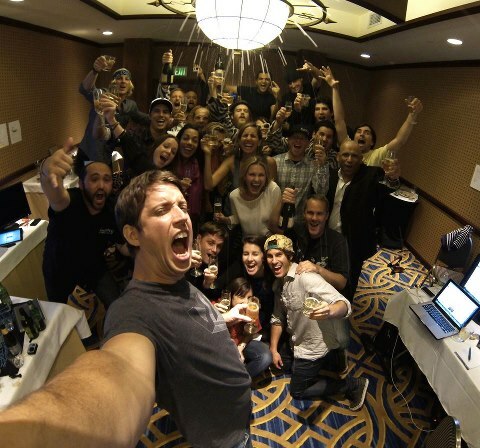 I think the GoPro boys are happy with the Launch. Initial Batch is sold out already. I started to order one. Went for a quick run and they were sold out when I got back. Shucks. They have put the ordering back up. Shipping in mid November now. I ordered one. I would like to mount it on a GH3 with the 35-100mm F2.8 or 25mm F1.4. That way I can get good 1080p @ 60 FPS video with a tight shot and good 720p @ 120 FPS wide angle at the same time. All while controlling both cameras from my phone. That sounds like a good combination to me. Anyone recommendation for Micro SDHC card? With 45Mbps, 1 hr recording would require around 20GB space. What estimated ship date did they tell you when you ordered yours? @mpgxsvcd They just said "your order will be delayed." I guess I missed the boat.